Last night I was about to send out a tweet to the effect that the six pack of Anchor Porter I was starting on was likely to be my last beer from that most august of craft breweries, and that fact actually made me sad. I really like Anchor beers, and they are not that easy to come by for some reason in this part of Virginia, so when I go to South Carolina I make sure to get a six pack of either their Porter or Liberty Ale. The reason I was on the verge of a one man boycott was the way management were stifling attempts of Anchor workers to unionise and use the power of collective bargaining to improve salary and conditions. To make sure I had my fact straight, I made sure to check on the old interwebs for stories about the situation, to be presented with news that the workers had successfully voted to unionise. Naturally I was very pleased, and assuming Anchor's management does nothing to punish or interfere with the workers' rights to be in a union I will continue drinking Anchor with a clean conscience. However, this got me thinking about how few craft brewery workers actually have union representation at their place of employment, and also the generally poor levels of remuneration and benefits for what is a dangerous job. 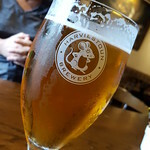 Based on a survey of salary and benefits done by Jeff at Beervana, it is very rare for a head brewer/brewmaster to earn north of $48,000 - which equates to £36,200 or €42,385. Jeff goes into much more detail here, and it is worth checking out his analysis, and subsequent posts. Given a median individual income in the US of $31,000, it would appear at face value that brewmasters are doing ok, earning 54% more than median, but let's take a moment to step away from the folks at the top end of the brewing totem pole. According to Jeff's analysis, a lead brewer is earning $38,000 per annum, still above the national median, but pretty much on par with the median in Virginia.Once you get to the bottom rungs of the brewing ladder, you dip just below the median salary. And yet, according to the Brewers Association, the craft beer market in 2017 was worth $26 billion, that's $26,000,000,000 (US billions being smaller than European billions, much like standard beer serving sizes). 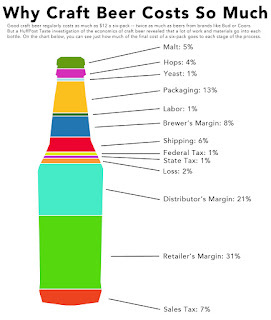 That $26 billion is in retail dollars, so let's remind ourselves of this breakdown of the costs of a six pack of beer. 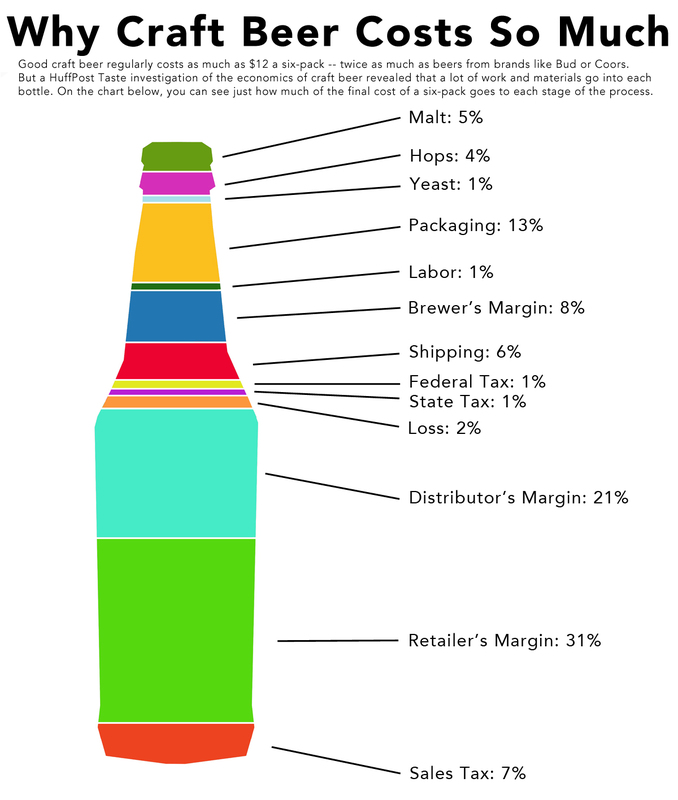 According to this infographic, 52% of the cost of the six pack is markup from the middle men that come between me and my beer, distributors and retailers. So using that number as a guide, the production value of the craft beer industry is about $12.5 billion. The most shocking part of that breakdown though is the cost of labour, just 1% of the cost of your 6 pack is the hours the brewers spent making that beer. Risking physical injury and even death in the event of a tragedy, to earn a single percent of the pie, the same single percent of the pie as the yeast gets. Perhaps it is the left wing blood that flows through my veins, being the grandson of a leader in the National Unemployed Workers' Movement in Scotland that lead hunger marches in the 1930s, but so little regard for the value of the workers making a company's beer sickens me. That may explain why when I hear stories of breweries that victimise workers for having the temerity to stand up to management and demand better working conditions (and some breweries I have seen the insides of are death traps) and better pay I will always stand in solidarity with the working brewers and thus not drink that brewery's products until workers are free to unionise. In the meantime, cheers to the workers at Anchor Brewing! Though of course those distributor's and retailer's margins are gross not net, and I don't doubt that a great many of them, especially independents, don't pay tremendously well either (though I admit there's less physical peril involved). Beer is ultimately a consumer good, so the margins are skinny all the way through.